If you prefer to contemplate with not only green lawns but also expanses of water from the windows of your house, you will surely enjoy WaterNest 100. 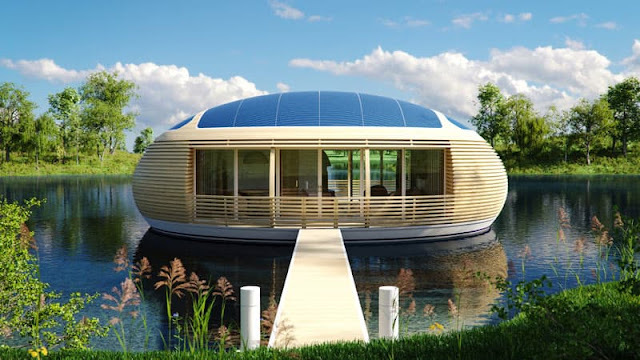 It is a charming eco-friendly floating mini-home. 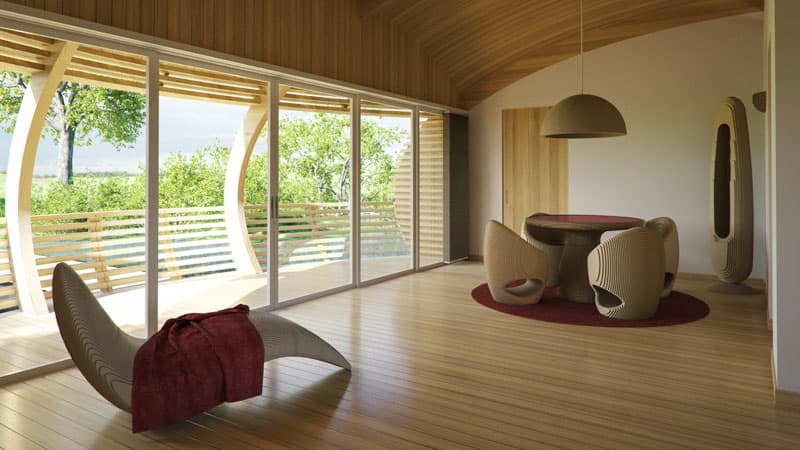 Being designed by Giancarlo Zema, this eco-house is equipped with solar panels that offer you a good chance to live in harmony with nature. It is made of environmentally friendly materials. According to the architect, this construction is up to 98 percent recyclable. The house can be mounted in any large and quiet water pond. 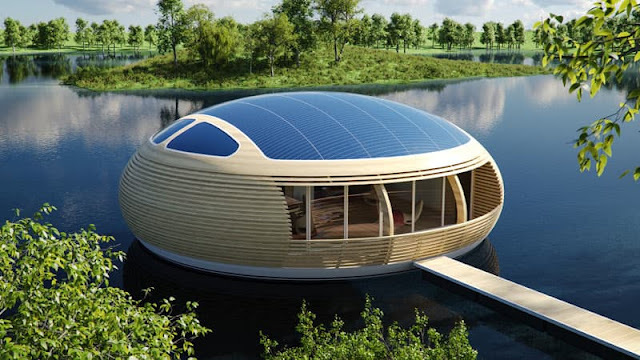 The floating house, with an area of more than 95 square meters, has a cocoon shape. The height of the ceiling is up to four meters, and its diameter is twelve meters. 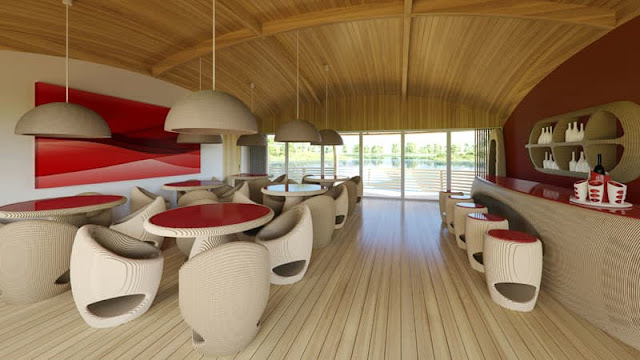 The curved structure of the body is made of laminated veneer lumber and recycled aluminum materials. 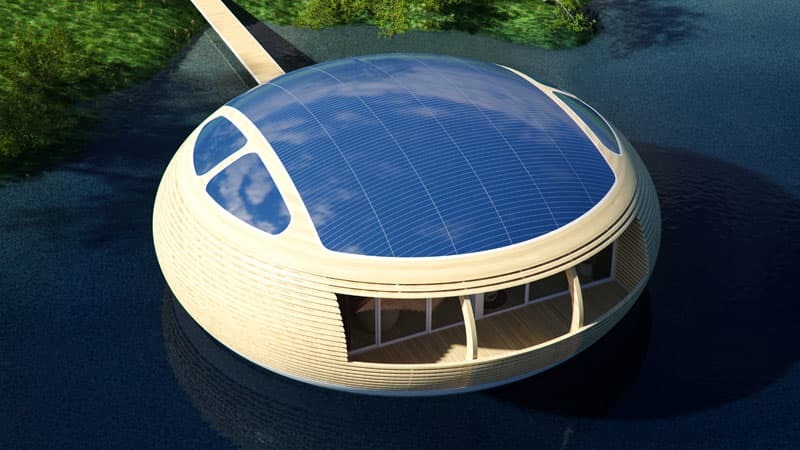 On the rounded wooden roof an array of photovoltaic panels is mounted. It has a total area of 60 square meters being capable to produce up to 4 kW of electricity per hour. Large windows and balconies around the house allow guests to enjoy freely the views of the water. 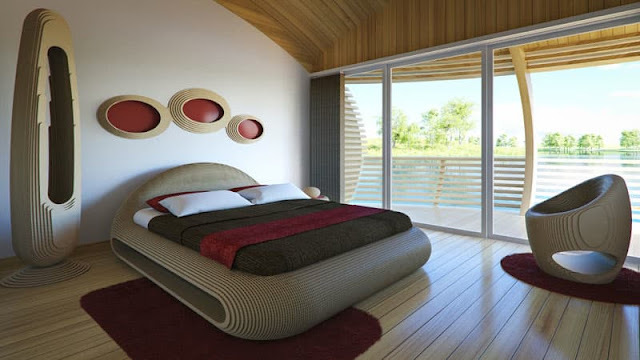 The "Floating Nest" can be a good option for becoming a family one, because the designers have taken care to provide enough building microclimate supplies. Developers have created a complex system of internal air conditioning and micro-ventilation. This allows you to categorize this floating structure as an economical ecosystem with low impact and low power consumption. WaterNest 100 also boasts of the flexible interior design that can be easily changed according to the needs of its residents. For example, if a floating house isn’t considered to be used as a dwelling, it can be also fit for an office, a home cabinet, a lounge bar, a restaurant, a store or even for the exhibition hall. 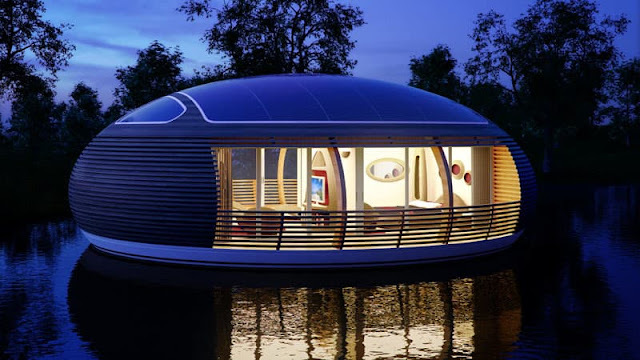 Thus, we see that there are advantages and disadvantages in the construction of the house on the water. Pros: it is an environmentally friendly home, energy consumption goes through solar panels, the house has enough space for a four member family or you can use it for any commercial purposes. The only minus is that you should build it in a quiet place - a river with a low water flow, a lake, a bay. And also you need a warm climate. Giancarlo Zema has tried to express his vision of environmentally friendly house where everyone could find his peace of mind, living there with his family or creating there a unique atmosphere of a cozy restaurant.